Did you know that foods may help you get rid of health problems naturally and rapidly without resorting to taking commercial medicines that may lead to some side effects? 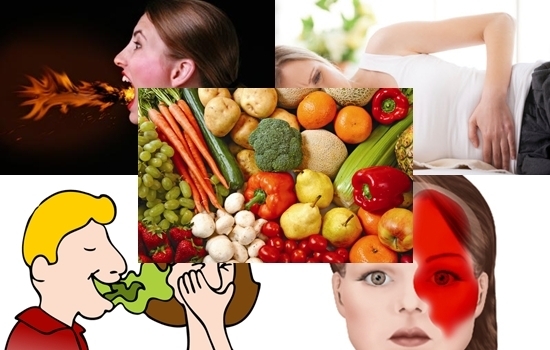 Here you will discover what are the best foods for the treatment of the following health problems. 1) Migraine headache: We advise you to eat fatty fish for the treatment of migraine such as salmon and sardines. Studies have reported that fish contain nutrient elements and fatty acids such as omega-3, which helps to get rid of migraine. 2) Menstrual pain: You can take flax seed with cornflakes for the treatment of menstrual pain. The flax seeds can help you get rid of cramps caused by menstruation. Cornflakes are good sources of magnesium, which helps to alleviate nervous tension in muscles. 3) Fatigue: To fight fatigue you can use quinoa seeds which are rich with vitamin B and iron. These dietary supplements are necessary to restore vigor and vitality to your body as well as soothing the nerves. 4) Exhaustion: When you are exhausted or angry you can eat dark chocolate as it promotes the serotonin hormone, which is the hormone of happiness that helps you relax and improves your mood. 5) Bad breath: Drink tea to get rid of the unpleasant and annoying smell of the mouth. 6) Joint pain: Get rid of joint pain by eating berries as berries are rich with vitamin C that helps you get rid of joint pain. 7) Heart burn: To eliminate heart burn you can take ginger according to the studies and researches conducted recently. 8) Constipation: Eat apples and pears to get rid of the problem of constipation. These fruits are rich in fiber that contributes to facilitating the defecation.